The best political commentary in America today, and beyond, is found in Tom Tomorrow’s work. Subscribe to SPARKY’S LIST and see it early. I do. You should too. It is so on the money you will be stunned. 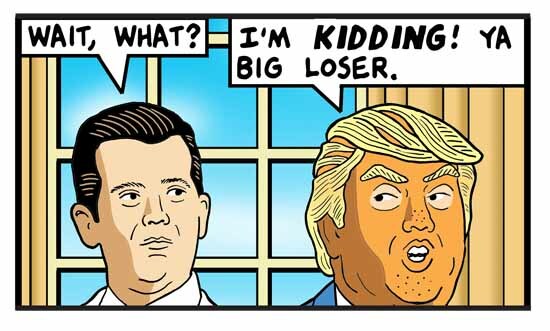 No one has provided such good political sense for so long as Tom Tomorrow. As a charter SPARKY’S LIST member, I can say how much poorer my life and my understanding would be without his clever, on-the-mark cartoons. 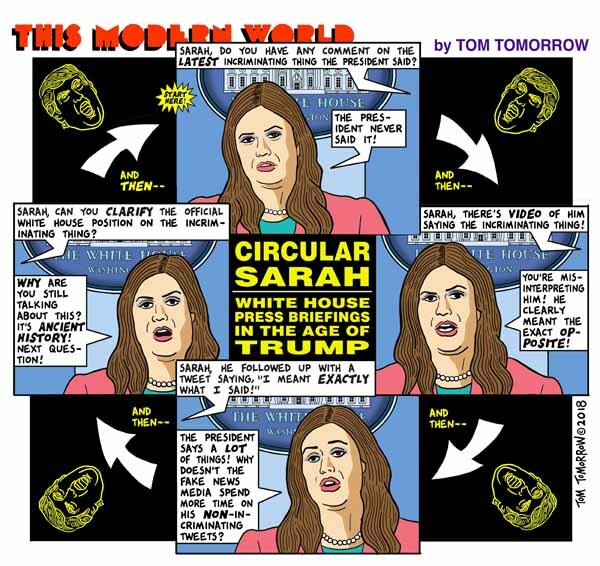 Tom Tomorrow’s work is brilliant and biting satire directed at the everyday tragedies and absurdities in the era of Trump. In the tradition of great political cartoonists that restore a sense of sanity and perspective to the afflicted populace. I am forever grateful! To sign up for SPARKY’S LIST please click HERE. To find out what SPARKY’S LIST is, keep reading. As you may have heard, the newspaper industry has been undergoing some difficulties of late. Far too many altweeklies have decided to save literally tens of dollars a week by cutting their most popular features — the comics. Thanks to the internet, my cartoons are more widely read than I could have ever imagined possible, when I started out almost three decades ago. But as my readership expands exponentially, my income continues to decline. I’m no economist, but that doesn’t seem sustainable to me. The uncertainty of my future was recently compounded by my divorce. For years, I counted on the security of my wife’s income as a way of cushioning the unpredictability of my own; unfortunately this is no longer an operative safety net. I’m still fortunate enough to have a substantial number of clients both in print and online, for which I am profoundly grateful — but the reality is that the world is changing rapidly, I just hit an iceberg in my personal life, and I need to keep figuring out different ways to stay afloat. “How can I help,” you are undoubtedly asking yourself at this moment, perhaps out loud, to the annoyance of your co-workers or the random pedestrians around you. Well, you can subscribe to SPARKY’S LIST. “And what is this thing called SPARKY’S LIST,” you would ask, if I were to continue with that particular framing device, which I think I will not. But to answer your imaginary question anyway: it’s a weekly email subscription service, which allows TMW’s most devoted readers the opportunity to get a sneak preview of the cartoon each Sunday, before it goes live the following week, as well as providing the convenience of having it delivered directly to your inbox. If you’re one of those people who can never remember where you left your keys or what day TMW appears on what website, this is the answer for you. About the cartoon, I mean. I can’t help you with your keys. SPARKY’S LIST also features occasional extras, such as short (or sometimes not-so-short) essays to accompany each new cartoon, alternate unpublished drafts of cartoons, contest/giveaways, “classics” from years past, personal photographs, and other bonus content depending on my mercurial whims. But don’t worry, I won’t spam your inbox — these will simply be the sprinkles on the delicious, weekly ice cream sundae that is SPARKY’S LIST. The cost is $10 for a six month subscription, which, for comparative purposes, is literally less than any common item or experience you can think of that would cost you more than $10! And in all seriousness, you’ll be helping to support my work and keep TMW alive in an ongoing moment of great uncertainty in my career, my personal life, and in the world at large. I forgot to feed the website again. 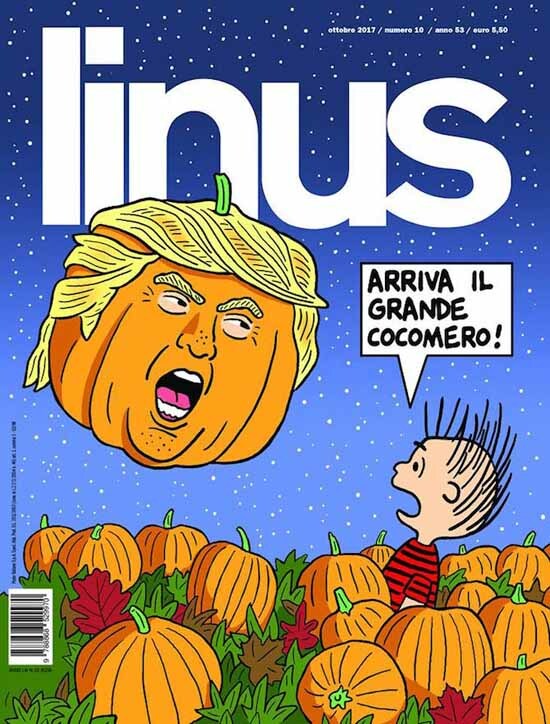 My cover for the Italian comics magazine, Linus. I’ll be in Italy for the second half of September to promote the crowdfunded Italian compilation, “Il Pazzo Mondo a Stelle e Strisce” (which I think translates roughly as “The Crazy World of Stars and Stripes”). This is the itinerary that I have so far; I will update this as I get more information. Sept. 16-17: Lector in Fabula cultural festival, Conversano. Sept. 22-24: Dialoghi di Trani festival, Trani. Sept. 29-30: Internazionale festival, Ferrara. And then on the afternoon of Oct. 21, I’ll be giving a presentation at the Witching Hour Festival in my hometown of Iowa City. The event is at the Englert Theatre, which was the movie palace of my childhood, back when movie theaters would run old school animated shorts before the main feature. I spent countless hours at the Englert as a kid, and have been wanting to do an event there since it became a live performance venue, so I’m especially looking forward to this one. This is an expanded edition, with some additional pages of Trump material (up through the election, basically). 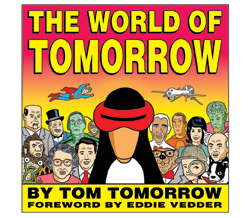 If you backed the original Kickstarter (at book level or higher) and would like to buy a copy of this edition, email me (tomtomorrow-at-gmail) and I’ll give you a code good for a discount.